Please note: We will be closed Easter Sunday. Happy Easter! 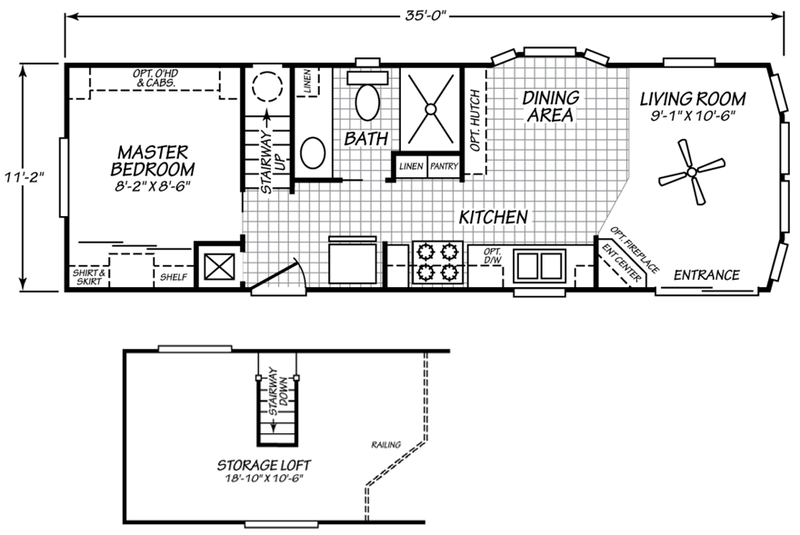 The Dorena model has 1 Bed and 1 Bath. 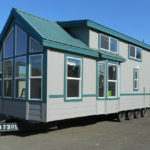 This 399 square foot Park Model Loft Park Model Home is available for delivery in Oregon, Washington, Idaho. 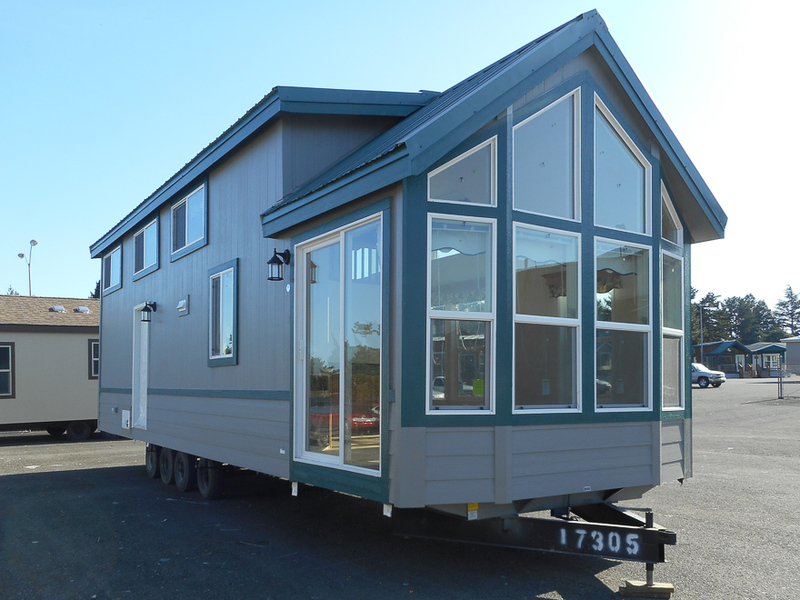 The exterior is showing an optional metal roof and the optional trapezoid window package. 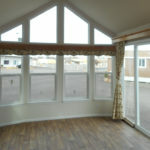 The dining room bay window is a standard feature. 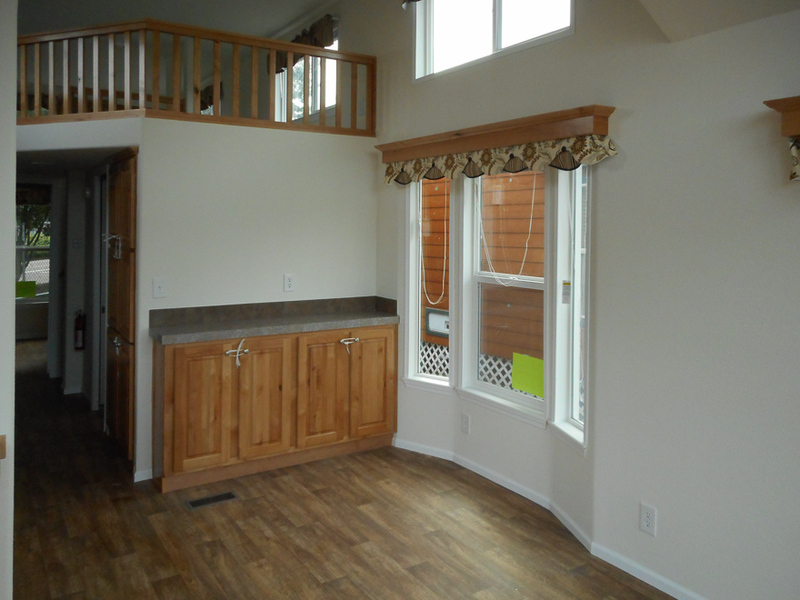 The 5′ sliding glass door is a standard feature and the 4 rows of lap siding wainscot is also a standard feature. 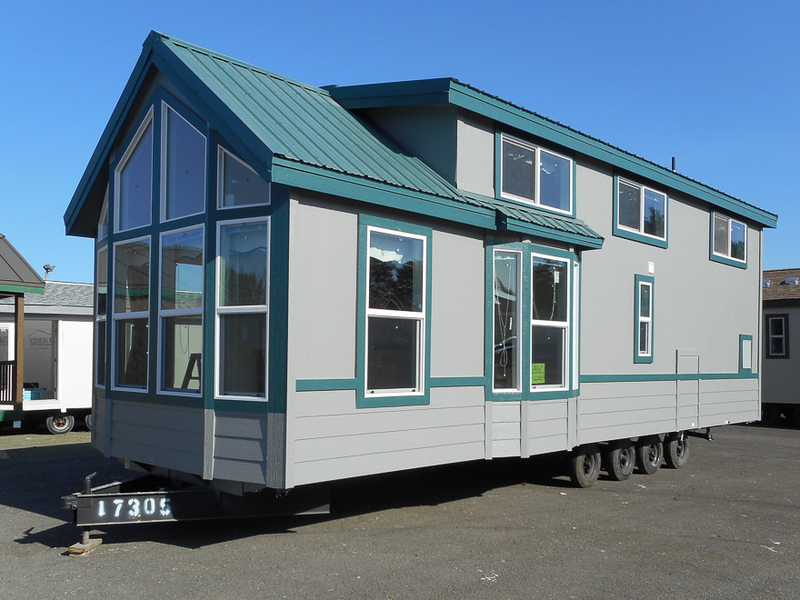 Some loft windows are optional. 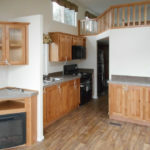 The knotty alder cabinets are standard and the living room entertainment cabinets are standard. 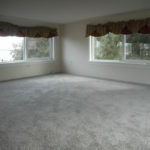 The dining room cabinets are optional. 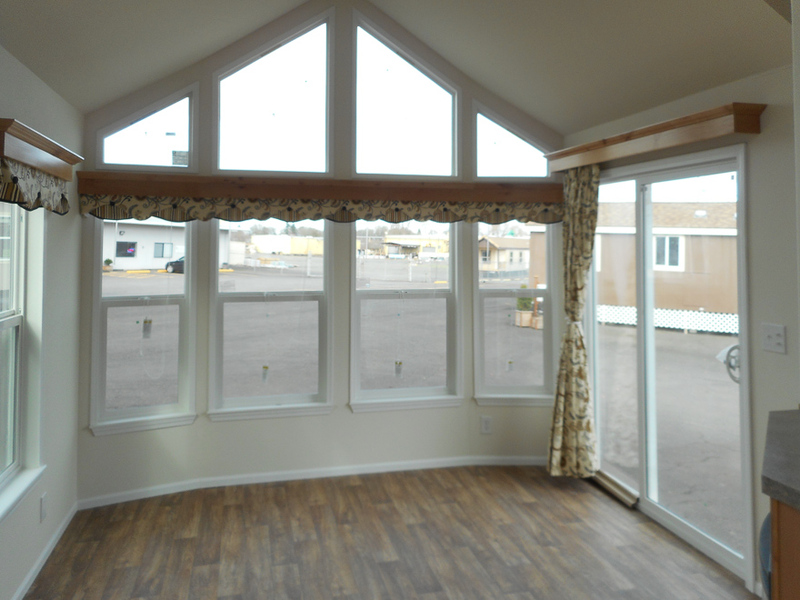 This home comes standard with the four lower windows on the front end. 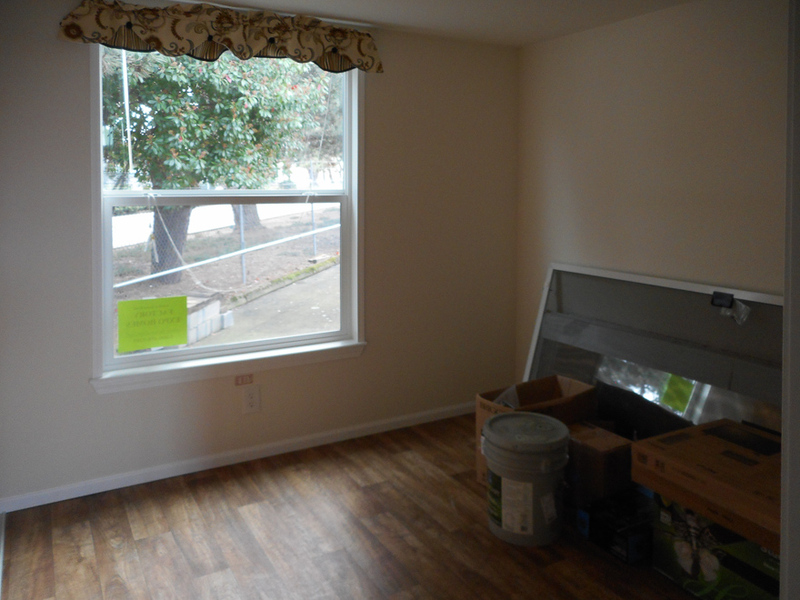 The trapezoid windows above are an upgrade. 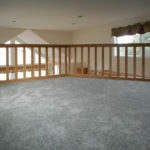 Linoleum in place of carpet in the living room is an upgrade. 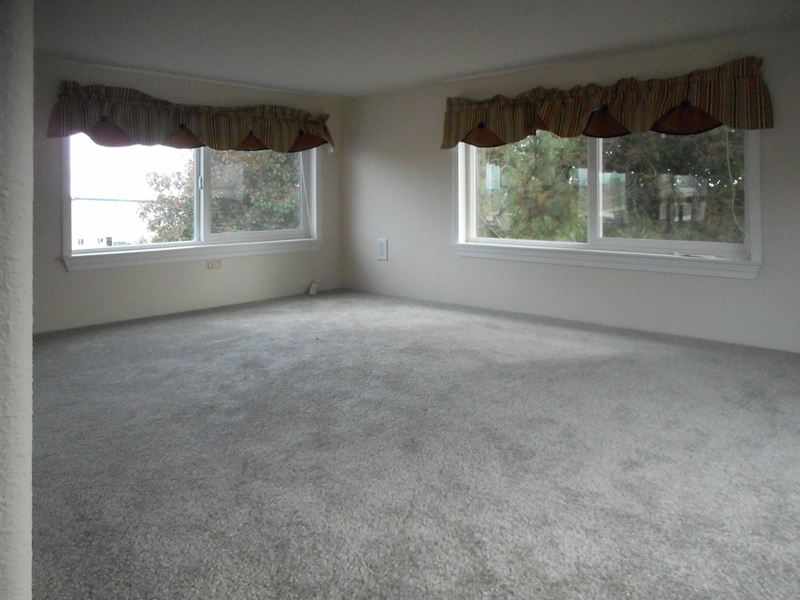 The ceilings are very high in the living room, kitchen, and dining area. 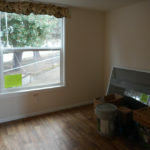 The dining room windows are standard. 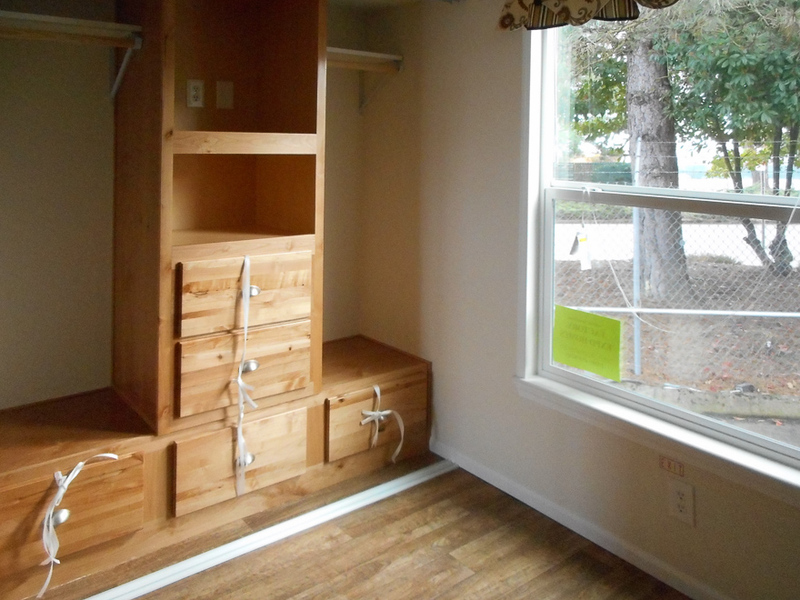 The hutch cabinets are optional. 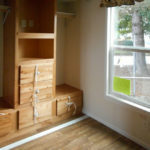 The bedroom includes a nice size window for natural light and for emergency fire escape. 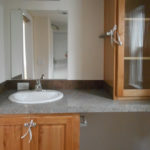 The bathroom includes cabinets as shown, a china sink, and single lever faucet. 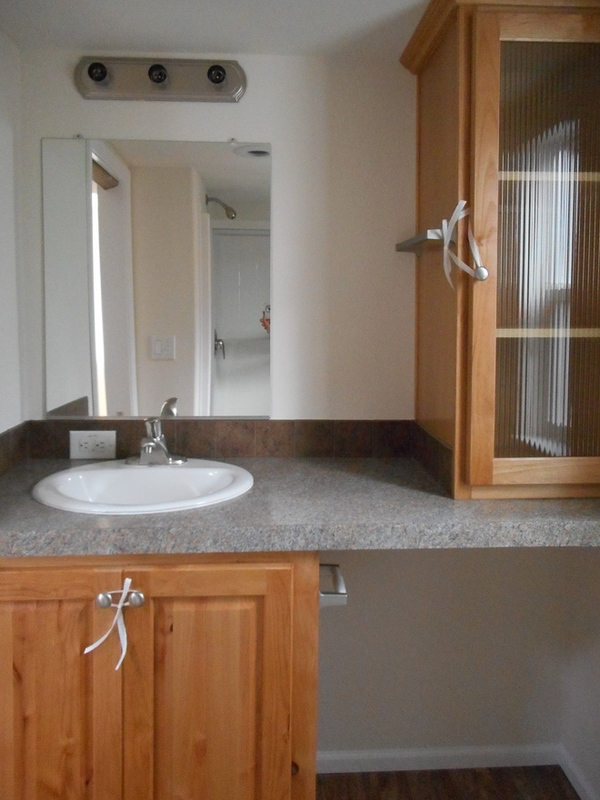 There is also a standard medicine cabinet to the left of the sink. 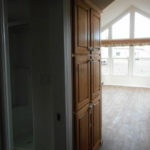 The hallway includes standard linen cabinets for storage. 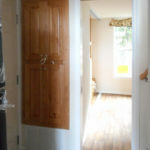 The standard propane furnace is in a compartment below the cabinets. 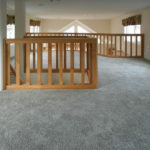 The loft includes choices of carpet. 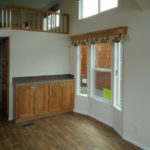 There is one optional loft window showing in this photo on the back end of the home. 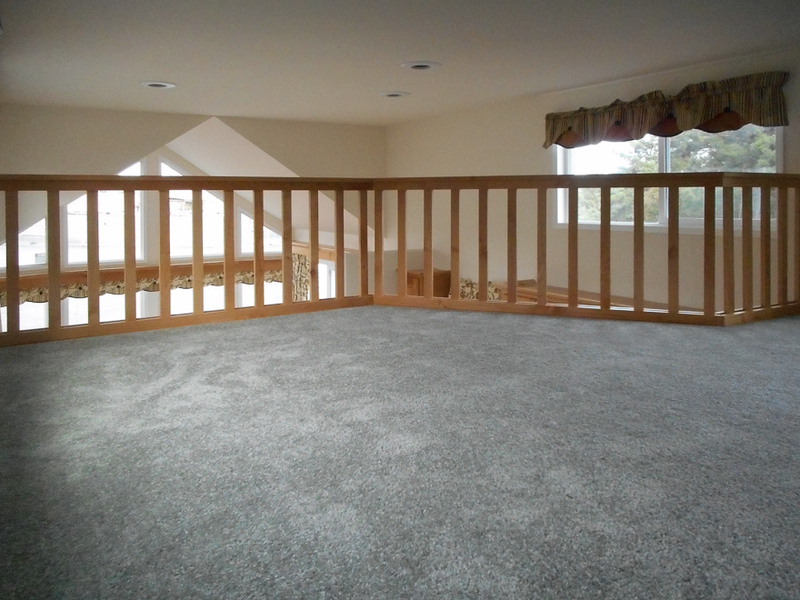 The loft railing will match the cabinet color and the loft is open to the kitchen and living room. 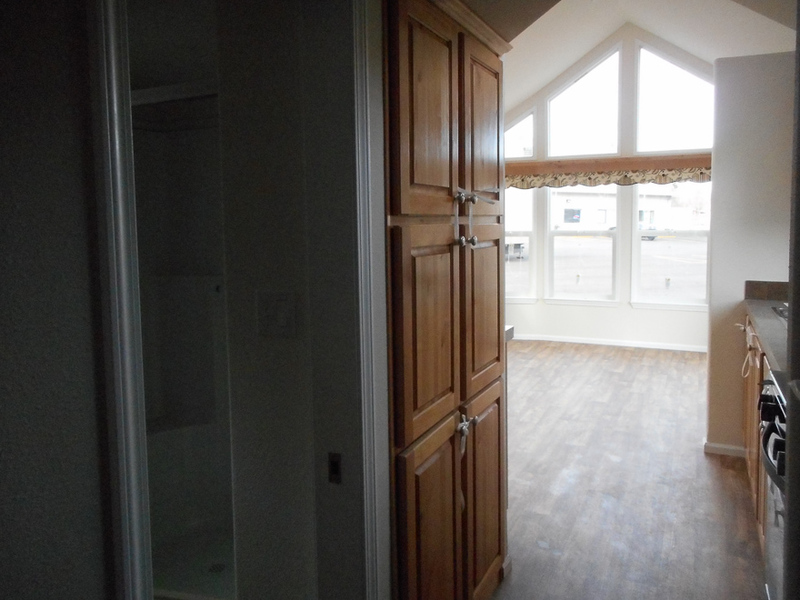 The standard double loft starts at the bathroom and goes all the way to the back of the home over the bedroom. 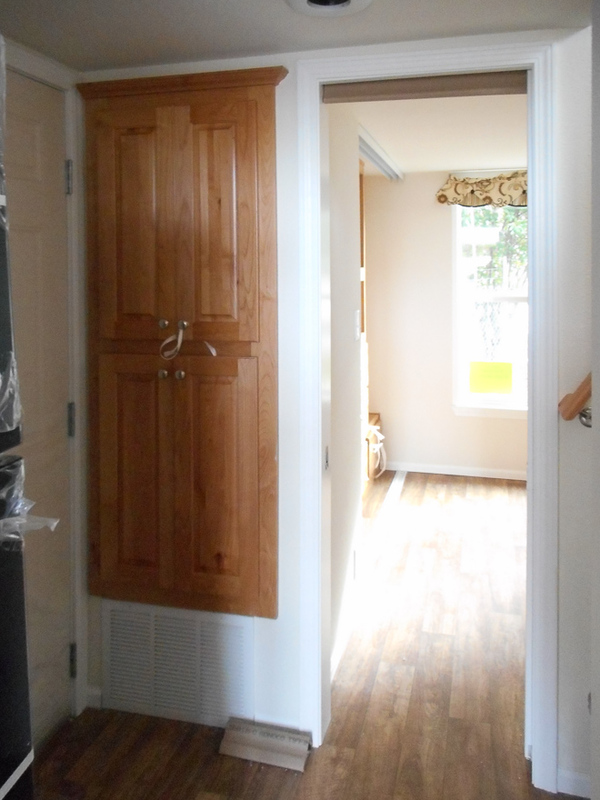 Hallway includes a 6-Door pantry cabinet for added storage. 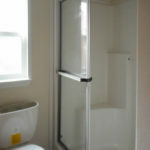 The bathroom features a standard 48″ walk in shower with seats. 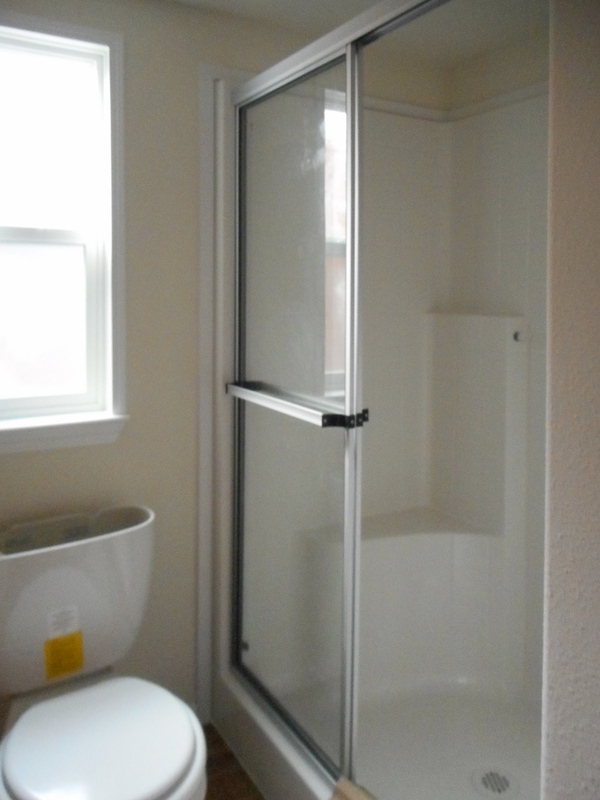 The window over the toilet is standard. 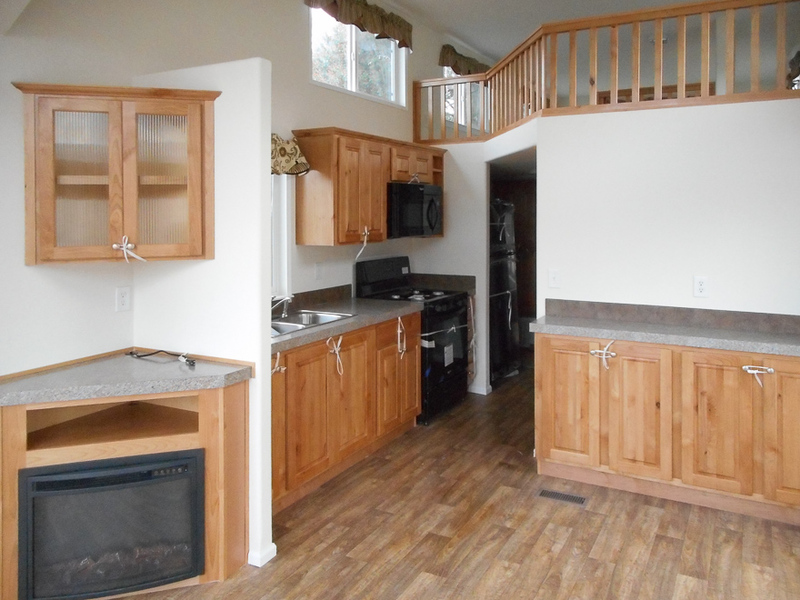 Ask your housing consultant about the other great features that come standard on the Dorena. 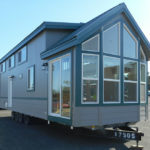 Cavco Park Models is the national leader in design, manufacturing and distribution of Park Model and Cabin RV’s throughout the United States. 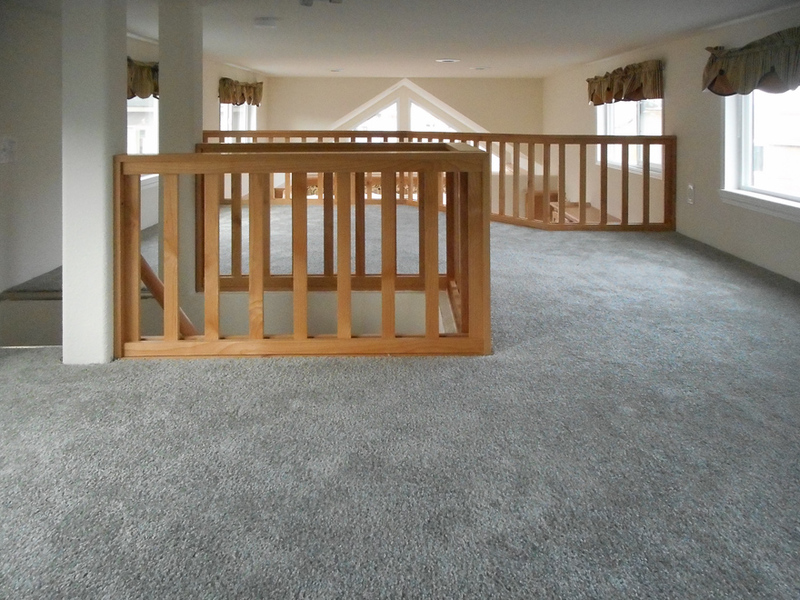 Four of the most recognized and experienced Park Model brands, locations in all regions across the U.S. and a combined total of over 50 years manufacturing Park Models makes us the most trusted and reliable source in the nation.